Need to boost your resolve for your 2018 resolution? 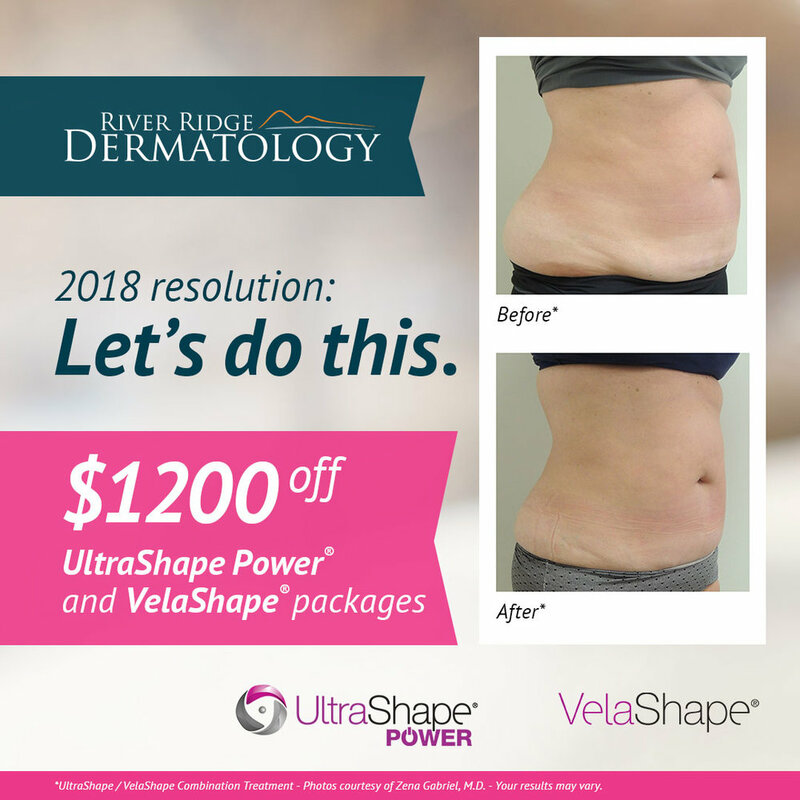 River Ridge is running a special on UltraShape Power® and VelaShape® treatments for the new year. UltraShape Power® packages are reduced by $1,000, and VelaShape® Club membership will be free, for a combined savings of $1,200. Three of our team members received a 2017 Best Bedside Manner Award from OurHealth Roanoke & New River Valleys Magazine. Congratulations to Dr. Chad Johnston for placing second and Dr. Aleksandra Brown for placing third for Dermatology in the New River Valley, and to Jason Bailey for placing third for Physician Assistant (PA) in Roanoke. You might be bundled up against the cold, but are you protected from the sun? With November’s melanoma report finding 12 new cases, we offer a friendly reminder that damage from the sun’s ultraviolet (UV) radiation can occur year-round. If you’ve been wanting to brighten your complexion, now’s the time. River Ridge is offering a special on our chemical peels, which also make great gifts for anyone wanting to refresh, revitalize and rejuvenate damaged skin. Note: Consultations must be booked with Dr. Brown and can be scheduled on the same day as the peel. River Ridge now offers The Perfect Derma Peel. This safe and effective medium-depth peel uses the powerful antioxidant Glutathione to lighten and brighten the skin. It works wonders for melasma or dark spots! Note: Consultations must be booked with Dr. Brown, and can be scheduled on the same day as the peel. It has been a while since we’ve shared a melanoma report, but we’re happy to say the numbers are down. We found just 14 new cases in October. The numbers are in—we found 22 new cases of melanoma in June. The good news is that melanoma is a preventable disease. We can’t stress enough the importance of regular skin checks and sun protection. We diagnosed 14 new cases of melanoma in May—the highest number since October 2016. Skin cancer is one of the most preventable forms of cancer, and we’d love to see this number significantly decrease. Last month, we found 10 new cases of melanoma. Please help us share these strategies for preventing and detecting this deadly skin cancer. Prevention: seek the shade whenever possible, avoid tanning beds, cover up, and use a broad-spectrum sunscreen. Detection: examine your skin head-to-toe every month and see your physician every year for a skin check. We are proud to announce that we won “Best Dermatology Practice” in Virginia Living Magazine's 2017 survey! Thank you to everyone who voted. We truly love our patients and the work we do to protect their health. River Ridge Dermatology was founded in 2011 and now occupies three offices in Blacksburg, Roanoke and Giles. Most recently, River Ridge began offering laser hair removal and body contouring, in addition to a full list of medical services, including skin checks, melanoma detection, surgical dermatology, and cosmetic procedures such as Botox and Y-Lift. We found eight new cases of melanoma in the month of February. Even though the temperature is cooler, the sun is still powerful—you should continue wearing sunscreen with at least SPF 15 every day. River Ridge Dermatology invites you to explore our cosmetic services and products during a spring open house on April 19th from 4-7 p.m. at our Blacksburg office (3706 S Main St. Suite B, Blacksburg, VA 24060). You can learn all about our new body contouring procedures and other cosmetic treatments designed to help you look and feel your best. We hope you will join us! Good news! We only found seven new cases of melanoma in the month of January—the lowest number we’ve had since September. We hope our patients continue protecting their skin. Three River Ridge Dermatology team members received a 2016 Best Bedside Manner Award, presented by OurHealth Roanoke & New River Valleys magazine. Dr. Chad Johnston was awarded Gold in Dermatology, Dr. Aleksandra Brown was awarded Bronze in Dermatology, and Susan Gaither was awarded an Honorable Mention for Nurse Practitioner. Last May, healthcare consumers and patients in the community cast more than 35,000 votes for the 2016 awards. Winners were announced in the December/January issue. Johnston, Brown, and Gaither previously won Bedside Manner Awards in 2012 through 2015. We keep our Facebook page up to date with links to the latest research and reports about skin and skincare, as well as updates about our practice. Like us so you can stay informed—and join the skin care conversation. River Ridge Dermatology is now the first practice in Virginia to offer a new body contouring treatment. Called the UltraShape Power, the procedure uses noninvasive ultrasound to permanently destroy selected fat cells. UltraShape Power is the first and only FDA-cleared procedure of its kind. Unlike other fat-burning treatments, it’s nonsurgical and doesn’t require any recovery time. Additional body contouring services offered by River Ridge Dermatology include the VelaShape and Kybella. Dr. Brown will also soon be certified in a minimally invasive facial contouring technique called the Y LIFT. These treatments add to the practice’s long list of comprehensive medical, surgical, and cosmetic services. It continues acquiring new medical technologies in an effort to provide its patients with the most advanced care. On the medical side, River Ridge Dermatology plans to offer in-house Mohs micrographic surgery in the coming months. The state-of-the-art treatment removes cancerous skin layer by layer, leaving healthy tissue unharmed. In honor of Melanoma Awareness Month, Dr. Brown discusses the importance of wearing sunscreen on a daily basis with WDBJ-TV. May is Melanoma Awareness Month, and doctors Aleksandra Brown and Chad Johnston are providing free skin cancer screenings in Roanoke and Christiansburg on May 6 and 13. “We see new cases of skin cancer in our office every day,” Johnston said. “When skin cancer is found early and treated, the cure rate is nearly 100 percent,” Brown added. However, if allowed to grow, melanoma can spread quickly—with dangerous, and sometimes fatal, results. One in five Americans will develop skin cancer over the course of their lifetimes, and more than 3 million people will be treated for skin cancer this year, according to studies published in the Journal of the American Medical Association (JAMA). The signs of skin cancer can be subtle—a patch of dry, flaky skin that doesn’t seem to clear up, a mole that becomes bigger or itchy, or a sudden new growth. Skin cancer affects men and women of every age and skin tone. People who have had several serious sunburns or have used tanning beds are considered at high risk, but some forms of skin cancer appear on parts of the body that are not often exposed to the sun. Screenings are first come, first served and will be held in private rooms at each location. Participants can schedule follow-up appointments with the doctors on the spot. Johnston and Brown are board-certified dermatologists at River Ridge Dermatology, caring for patients in Blacksburg, Narrows, and Roanoke, Virginia. Their practice offers comprehensive medical, surgical, and cosmetic dermatological services for adults and children. River Ridge Dermatology, with offices in Blacksburg and Narrows, is opening a new location in Roanoke on December 1. The practice is currently taking appointments for new patients. The office will be at the former location of Virginia Skin and Vein. The River Ridge Dermatology team welcomes patients of Dr. Marty Smith, who retired recently. Jason Bailey, a physician’s assistant with Virginia Skin and Vein, will practice with River Ridge Dermatology. River Ridge Dermatology’s board-certified dermatologists — Chad Johnston and Aleksandra Brown — will treat patients with medical skin conditions and perform any needed surgical procedures when necessary. Cosmetic dermatology treatments will also be available. River Ridge Dermatology offers same day and next day appointments most days, and accepts most insurances.